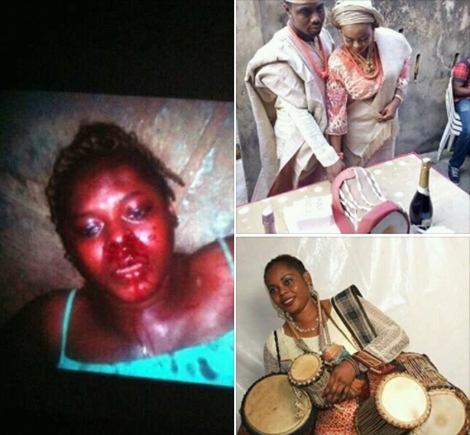 "Look at what he did to her just after few months of marriage. Some of us here will know this lady, Adebukola Shittu the popular Nigeria female drummer. "She's a friend of mine pls this kind of man must not go unpunished." haaa! this is callous ...why na? we know women can be annoying sometimes but not to lay a hand on her....at all. I sincerely don't support this at all...i think this Mr. Oga need to be visited by the police for this act...! nawaoo husband from the pit of hell Iyawo sorry oooooooo. Please let us not be quick to judge, maybe the woman must have chopped of his peen.....be4 he took this drastic action,although wat the man did waas a complete nonesense. some men are despicable and wicked. Save that Rubbish coming out from your mouth. A real man will never beat a woman.